How do you create a separate home theater within the open format living area of a luxurious apartment without compromising the environment, which distinguishes the home? For the Walters-Storyk Design Group the solution was to engage telescoping, floor-to-ceiling walls. The resulting installation maintains the home’s loft-like, kitchen/ dining/living room atmosphere for everyday life, and provides an elegant, fully enclosed 377 SF/35m2 home theater for screenings. 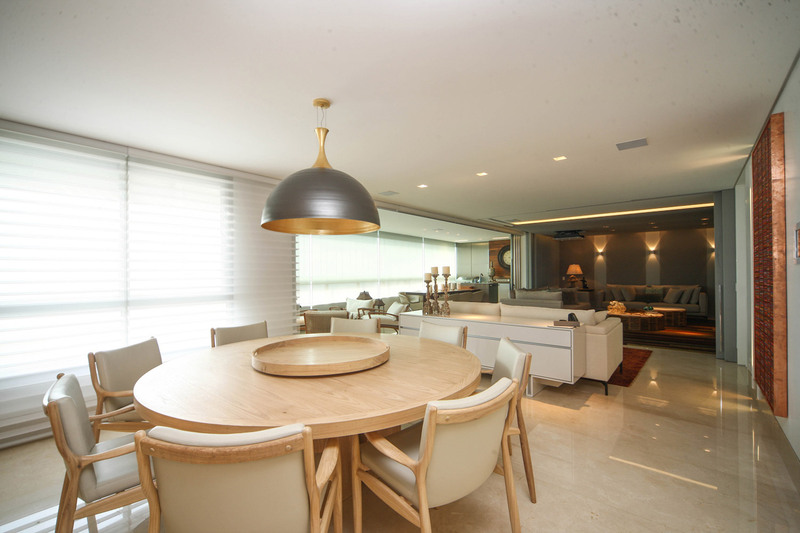 Located in Belo Horizonte’s prestigious Belvedere neighborhood, the Penna Home Theater is outfitted with comfortable couches and related amenities. 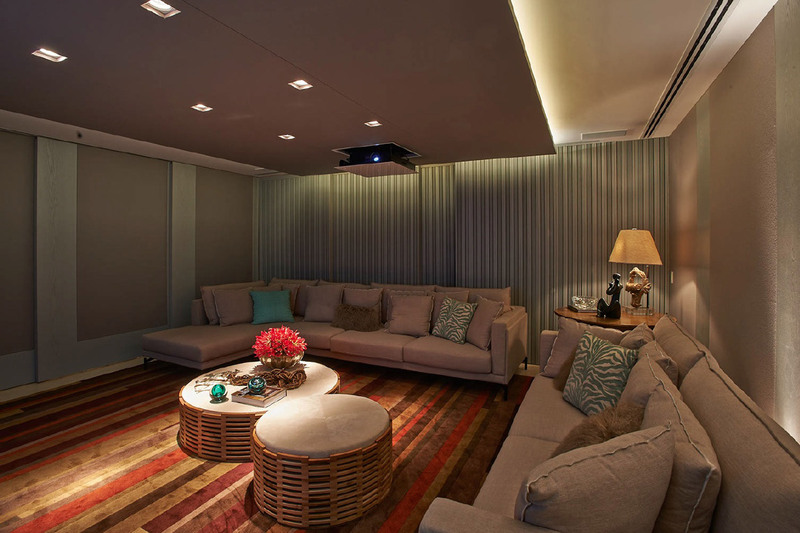 Recessed lighting is set into a custom acoustic ceiling cloud, along with a Panamax MAX 5100 Surge protector which lowers electronically to project programs on the Tela Eletrica 106” 16:9 Tensionada screen. OPPO DBP 83 Blu Ray, Panasonic BD 60 DVD Blu Ray and related first tier audio/video units are set in a console flanked by Anthem AVM 50 pre amp and MCA 50 amps at the front of the home theater. 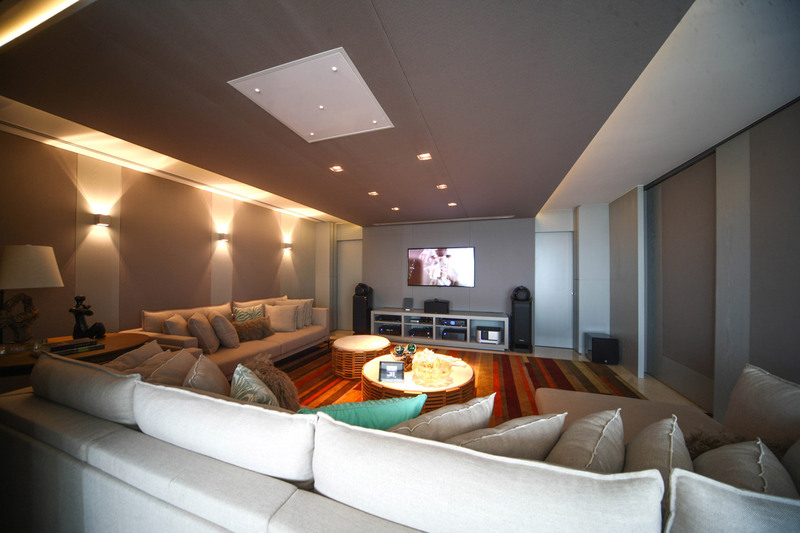 Two sets of customized, three-section, telescoping acoustic walls ride out on tracks embedded in the ceiling and floor to divide the home theater from the rest of the apartment. Acoustical fabric absorption treatments were added to the insides of the sliding panels, wooden diffusion treatments were fixed to their backs, and a QRD diffusor was applied to the rear door. A single unit accordion-style room divider may be drawn behind the rear, telescoping wall if necessary. acoustically-treated retractable walls were installed on tracks around the perimeter of a 400 sq ft. section of the apartment’s primary living space. Recessed, the nesting walls present an unobtrusive proscenium. Fully expanded they completely cordon off the home theater to enable viewers to enjoy their video entertainment while other guests take advantage of the rest of the apartment.